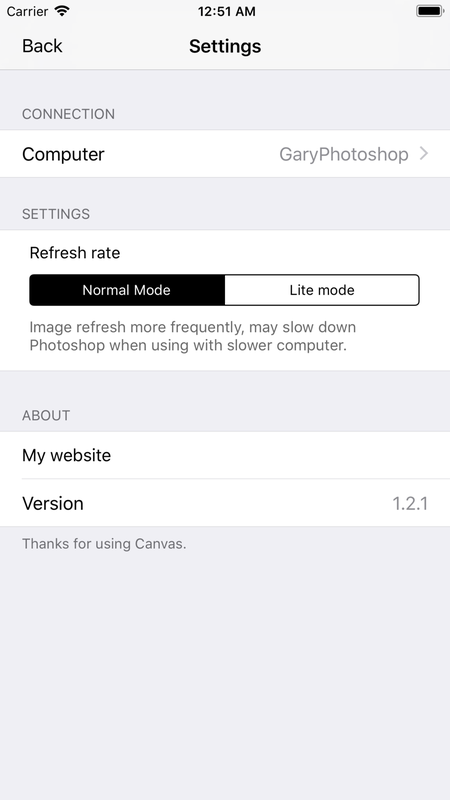 If you have trouble setting up Canvas for Photoshop, please try with steps below. 1. Go to "Edit" > "Remote Connections..."
2. Set a name, password and save with "OK"
3. Open any file, we are going to connect it in the next part. 1. Go to Canvas’ top-left "Settings" -> "Connection"
2. Your Photoshop should show up with the name you entered, tap on it and enter your password. 3. Now go back to main screen, Canvas should show whatever you have opened with your Photoshop. What should I do after connection is made? You can open any Photoshop document, and Canvas will show preview of that file. If you are using a document with Artboard. Please select an artboard first. Does it works on Windows? The app is based on "Bonjour" and it's auto-discovery feature. I have not tested it with Windows. But some users report success with install of Bonjour or iTunes. At this moment, I have no plans on the android version. What kind of connections does it support? The app should works when your device and computer are on the same network. Including Wi-Fi local network or Personal Hotspot. Although it's not stated, it might work with USB connection in some cases.